The BBC has withdrawn warnings that Doctor Who should not be viewed by children under the age of 8 after an outcry from fans. Politicians and devotees of the programme criticised the corporation after 'Me Times revealed a BBC edict stating that the new series was too youngsters. More than one hundred parents have complained that their youngest children suffered nightmares after last Saturday's episode, which featured killer zombies in Victorian Cardiff. But Tim Collins, the Shadow Education Secretary, who is a Doctor Who fan, argued that a little fright is a good thing. It's about the battle between good and evil," he said "There are monsters in it but they are always vanquished I think the programme has always been intended to provide a legitimate scare to children, an enjoyable scare" It was perfectly appropriate for six-year-tide, he said However, Mr Collins bated a compromise Shadow Cabinet position that Doctor Who should not be viewed by children aged 3 and younger a policy used in his own home. Fearing a revolt by licence-fee payers, the BBC issued a statement withdrawing advice that under-8s should not be allowed to watch the show. A spokesman said 'We leave it to the discretion of parents to ultimately decide what is suitable for their children." The Unquiet Dead instalment, written by Mark Gatiss, featured corpses possessed by aliens and a grandson strangled by his zombie grandmother. But scary scenes and storylines are integral to the series and vital to Doctor Who's international sales potential. Ofcom, the communications regulator, has received complaints about The Unquiet Dead and will investigate whether the episode breached pre-watershed guidelines. APA 6th ed. : Sherwin, Adam (2005-04-15). 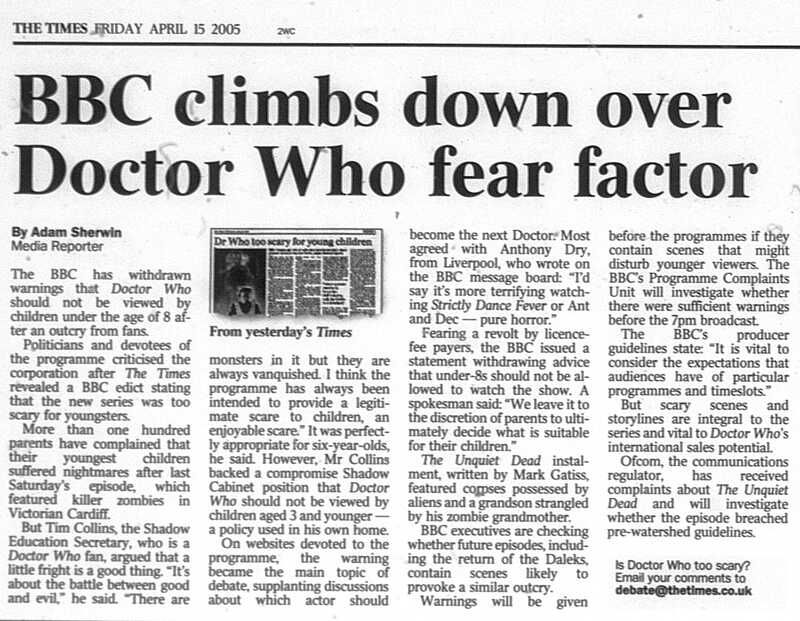 BBC climbs down over Doctor Who fear factor. The Times p. 13. MLA 7th ed. : Sherwin, Adam. "BBC climbs down over Doctor Who fear factor." The Times [add city] 2005-04-15, 13. Print. Turabian: Sherwin, Adam. "BBC climbs down over Doctor Who fear factor." The Times, 2005-04-15, section, 13 edition. This page was last modified on 26 April 2014, at 18:46.